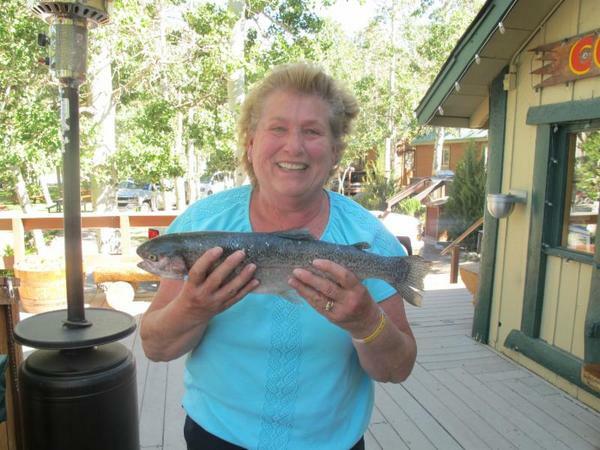 Catch of the Week: Sheri Wersky from Placentia, CA with the "Catch of the Week" landed along the South Shore. This beast was a 6 pound 5 ounce Rainbow caught with a Nightcrawler. Nice catch, Sheri! Brian Wersky from Placentia, CA with a fat 4 pound 1 ounce Rainbow caught with a Nightcrawler. He was fishing the South Shore. Stephen Teuton of Georgetown, CA landed a nice 3 pound 5 ounce Rainbow using an Inflated Nightcrawler. He was fishing near the Outlet. Jim Trogee from Anaheim, CA caught a 3 pound Rainbow using a Nightcrawler. He was fishing along the South Shore. Wanda Johnston of Whitewright, TX hooked into a 2 pound 11 ounce Rainbow. She was fishing the Inlet area with a Needlefish. Tactics/Bait: Most of the larger fish caught this week were hooked with Powerbait or Inflated Nightcrawlers. The top Powerbait colors were Yellow and Green. The hot lures were Kastmaster, Thomas Buoyant and Needlefish. In the creek, try salmon eggs, small spinners or Marvel Flies. The top fishing locations this week were the Inlet and South Shore. Alternative locations to try would be the North Shore, Jetty/Outlet Area and Hangman's Tree. Here is a list of other baits/lures that can be productive: Panther Martins, Tasmanian Devils, green or brown Marvel Fly Lures, Kastmasters, NeedleFish, Roostertails, and garlic scent on Powerbait. Dry Flies: Adams, Female Adams, Cutter's Caddis, Elk Hair Caddis, Stimulators, Black/Red Ants, Sierra Bright Dot, Royal Coachman and Hoppers. Streamers: Wooly Bugger (black, brown, olive, or green), Mutuka (black, brown, olive, or green), Hornberg, and Muddler Minnows. Wet Flies(Nymphs): Prince Nymph, Flashback Pheasant Tail, Hare's Ear, Zebra Midge (red and black), Copper John (red and copper) and San Juan Worm (brown or red). 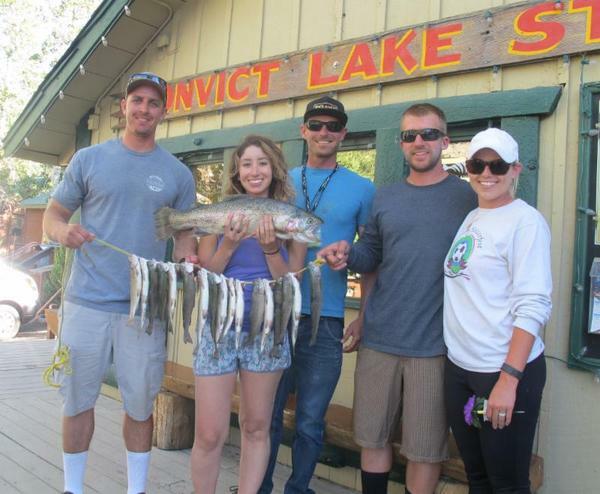 Other Resources: View our Convict Lake Fishing Map and Fishing Rig Suggestion brochures. Both brochures are available in the General Store. 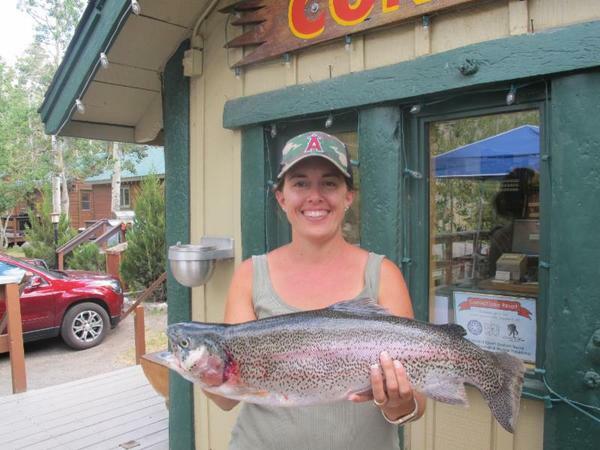 Derby News: The Ambush at the Lake fall fishing derby will be starting on September 5th and running until the end of the 2016 fishing season. Don't miss out on the chance to win $6,000 in Resort prizes! The Morrison Bonus will be on the weekend of October 28-30. $2,200 in cash prizes. Weather: The forecast has mostly sunny skies with slight chance of afternoon thunderstorms at the start of next week. Sunny and warm throughout the rest of the week. The high temps starting Monday will be in the low-80s and the lows will be in the mid-50s. Here is the National Weather Service link that is usually quite accurate: 7-Day Forecast Convict Lake. Sunrise - Sunset: Sunrise this week 5:58am - 6:01am and Sunset 8:07pm - 8:01pm. Stocking: The DFW is scheduled to plant both the lake and creek the week of July 31st. Thank you for your continued interest in Convict Lake. For more information please contact us or visit our website. EasternSierra.FishReports.com © 2019. All Rights Reserved.